The compact, rugged Olympus XA was a great choice in the film era for anyone who wanted a fair amount of image quality in the smallest possible size. 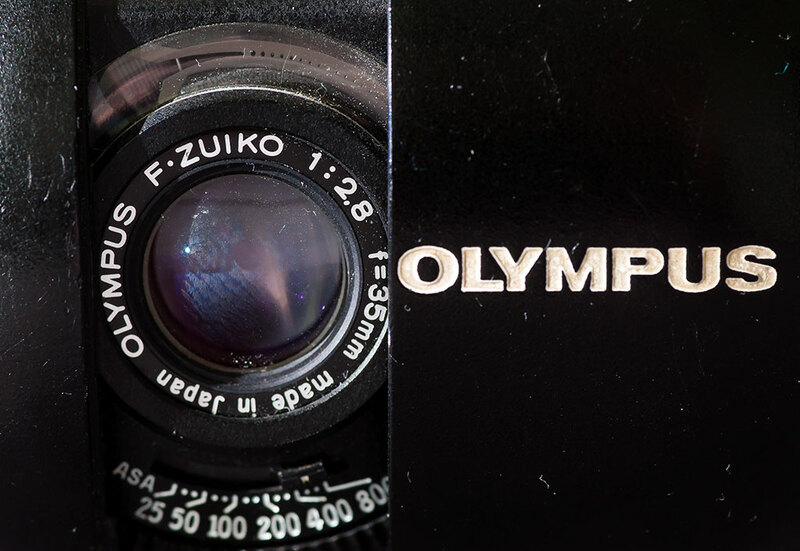 For many years of the later film era, Japanese camera maker Olympus specialized in building very compact 35mm film cameras. Hardware like the original OM-1, for example, was thought to be the smallest you could practically manufacture an SLR camera. 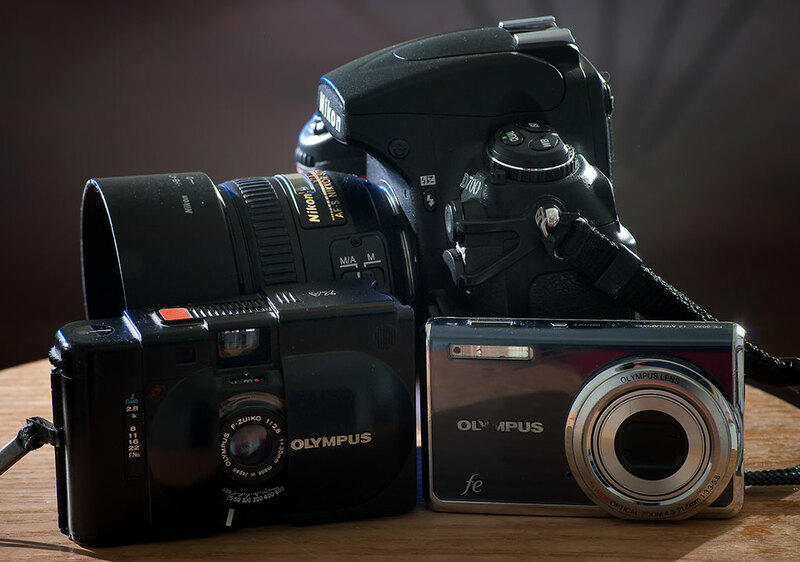 The Olympus XA is pictured with an Olympus FE-5020 and the full-size DSLR, the Nikon D700. 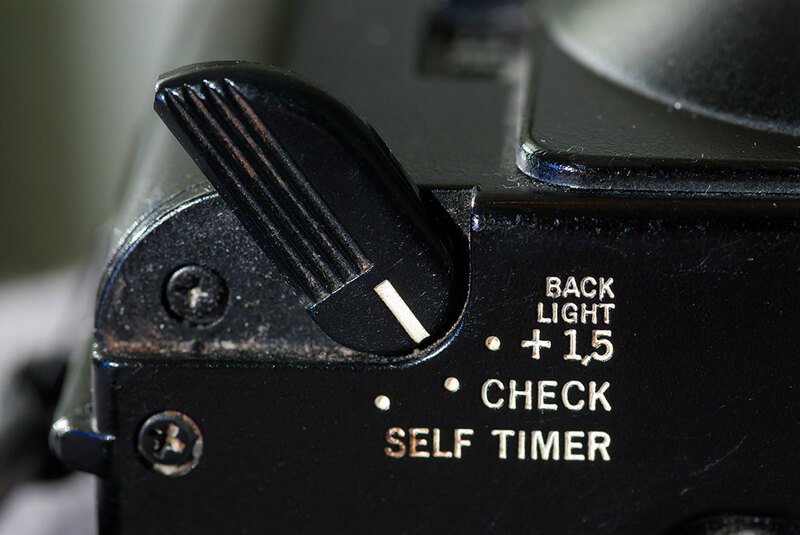 To save space, Olympus created one small switch with three functions, self timer, battery check, and +1.5 exposure compensation. If you needed additional exposure compensation, you had to change the ISO, fooling the camera into + or – exposures. Also from this company were the point-and-shoot class of cameras, which, without the need of a pentaprism for the viewfinder, could be made smaller still. 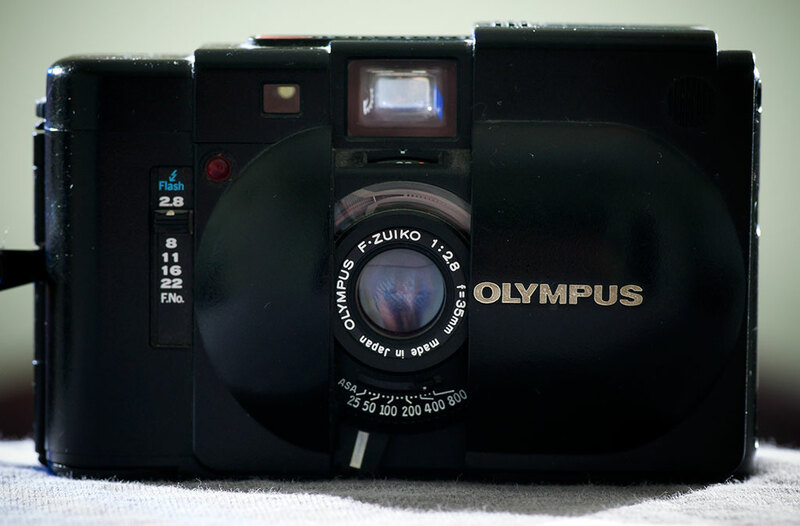 One such camera I coveted was the excellent Olympus XA. I had one for years, and in spite of my fanciful imaginations about the kinds of pictures I would make with it, I actually shot very few images with the XA. The XA uses a two-window rangefinder focus system, creating the faint yellow image in the center of the finder: double-image is out of focus, and making the images come together is in focus. 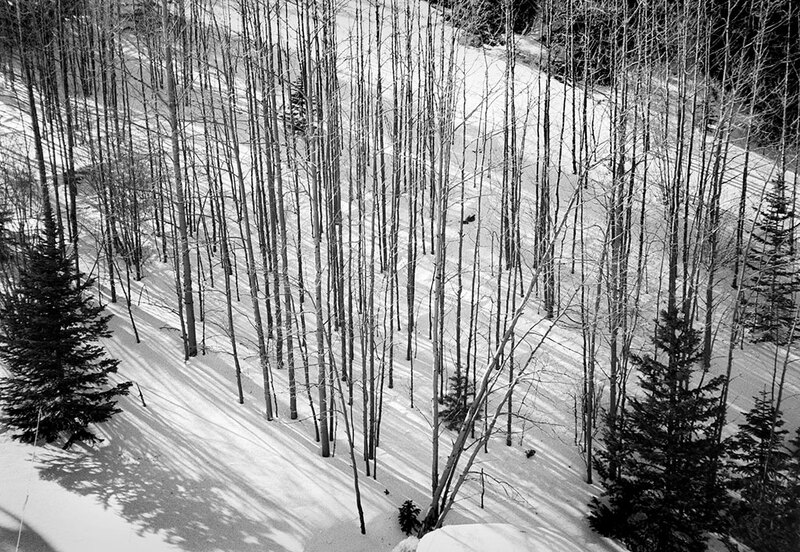 I sometimes carried my Olympus XA on ski trips in a coat pocket. As you can see, it made sharp images in unchallenging light. Aperture on the XA is selected using this small slider on the front face of the camera. 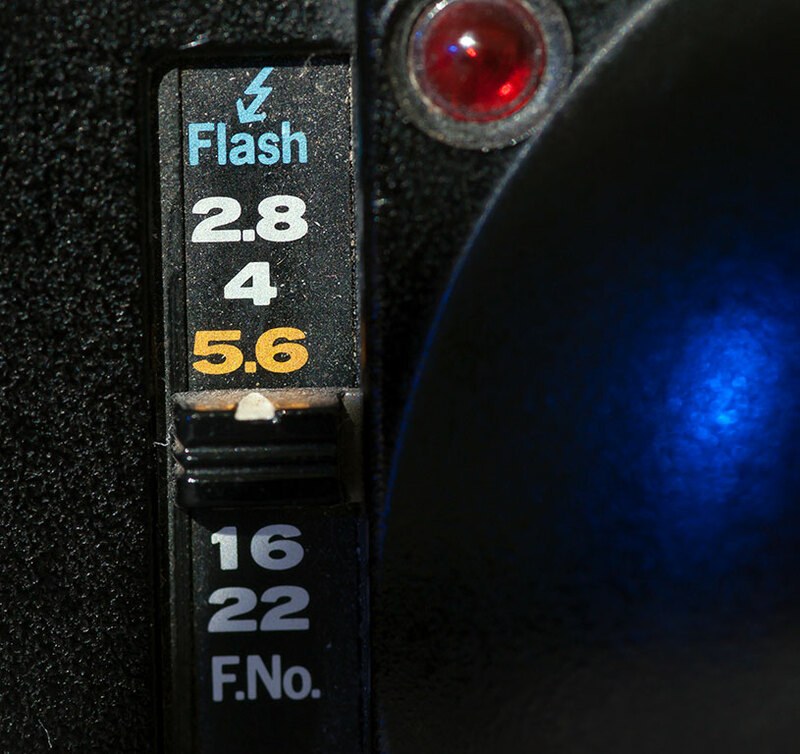 Exposure is controlled using aperture priority, meaning you pick the aperture, and the camera selects the shutter speed based on how much light it sensed and the film’s ISO rating. In hand, the XA is not particularly easy to use. The focus lever, just below the lens, is tiny and hard to reach with the camera to the eye. The aperture selector is out of sight unless you point the camera toward you. The ISO dial requires a fingernail to operate. The XA features a 35mm “prime” (non-zoom) lens, which buys it more quality for less size, and allows a decently large f/2.8 maximum aperture. A 35mm lens for 35mm film equals a slight wide angle. 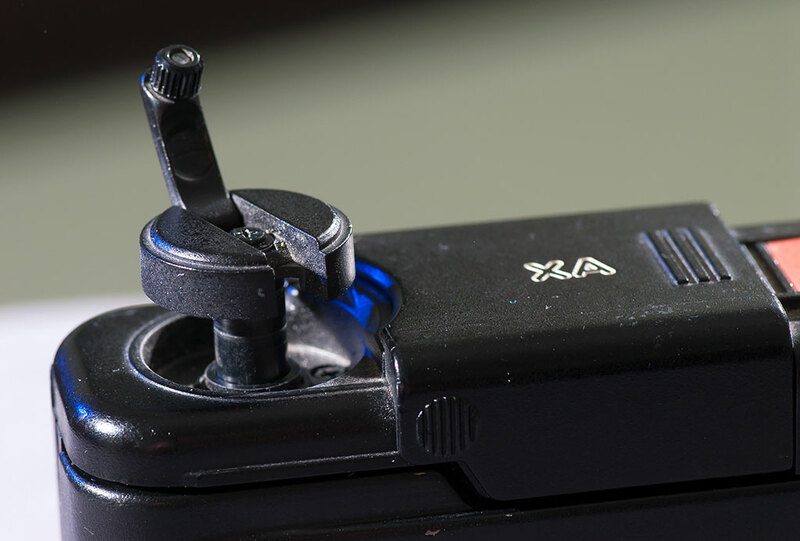 This is the film rewind lever on the XA. In the film era, you could turn this in the direction of the arrow on top of it (clockwise viewed from above) to feel if there was film inside, and you could see it rotate in the opposite direction when you advanced the film to the next frame. The clamshell design is a good form factor. When it is closed, the camera is smooth and well-protected from pocket stuff like keys. All this is put together to achieve true pocketability . The XA is so small, in fact, it had a wrist lanyard instead of a strap. It’s likely the XA is the smallest you can make a camera that will hold a roll of 35mm film. I like to imagine that if I had a digital conversion kit, I would use this camera, but the truth is that I have an Olympus point and shoot that I almost never use. So the XA remains an amusing but unutilized item in my collection. 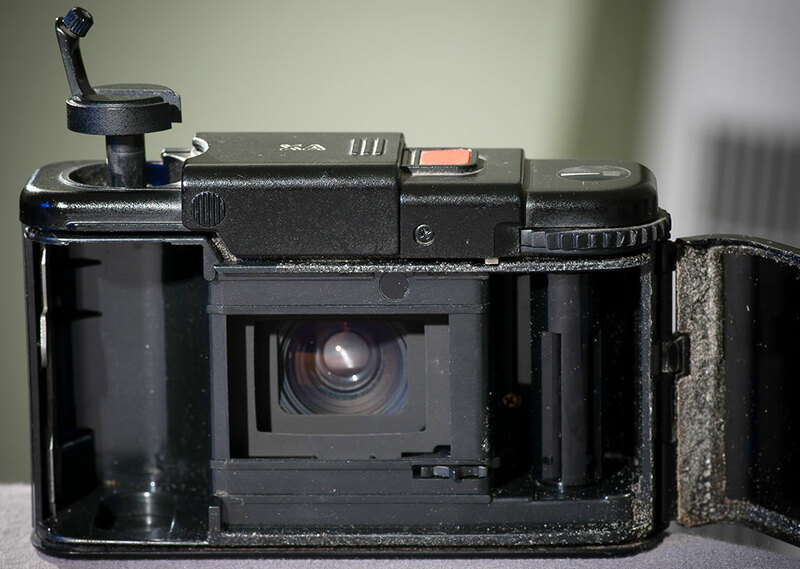 You can see from this image of the open back of the Olympus XA that it is just barely able to ingest a roll of 35mm film. Fascinating — though mostly over my head. I can tell you love what you do.